The number of those who flee from war and violence and who live in makeshift shelters in a permanent state of humanitarian emergency—for instance in refugee camps—rose dramatically in the past year. With a number of research projects, the topic of ‘displacement’ was in the focus of the work of the peace and conflict research institute BICC (Bonn International Center for Conversion) in 2015/2016. 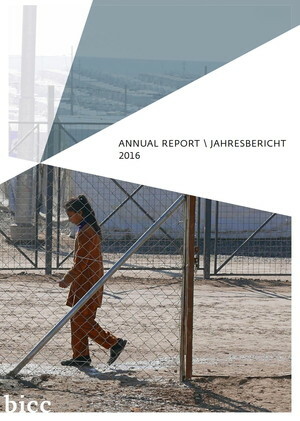 Further important topics of the Annual Report are research and advisory activities on small arms control as well as research on violent actors and their social embeddedness. In its topical cluster of “Armament and Arms Control”, BICC continues to focus on small arms control in the Sahel, the Maghreb and West Africa. BICC advisors not only conducted workshops and trainings on small arms control in these regions characterized by civil wars and violence but also provided direct advice to national governments and regional organizations. These activities were financed by the German Federal Foreign Office. Studying violent actors, such in Ukraine or in Afghanistan, is yet another focus of BICC’s current work. “At present, BICC is primarily interested in, on the one hand, gaining a better understanding of the mobilization of militias and, on the other, examining how violent actors can be reintegrated into a post-war society”, stesses Conrad Schetter. “BICC innovatively combines empirical research in areas of conflict with direct political and technical advisory services on the ground“, Conrad Schetter describes how BICC operates. The institute has been able to markedly expand its international peace and conflict research activities in the past year. In the period covered by this Report, 2015/16, BICC staff conducted research and provided expert advice in, for example, Ethiopia, Afghanistan, the Democratic Republic of the Congo, Iraq, Iran, Jordan, Kenya, Kyrgyzstan, Mali, Morocco, Myanmar, Nigeria, Somalia, Sudan, South Sudan, Tajikistan, Thailand, Chad and Ukraine.